Before I was married, I worked out almost every day after work. I’d head to the gym straight from work and get a solid 60-90 minutes in before heading home. I came up with a workout regimen where I’d focus on different areas each day, the whole shebang. Then I got married and we moved to a different state where I had a 40 minute commute to work. I didn’t go every day anymore, but I did still try to make it a priority to go a few times a week and found a workout buddy who helped motivate me and we both contributed to our regimen. Then…I became a parent. Ha! I’m now a stay-at-home mama with a part time work-from-home job. It feels like my brain is full of about 23049823 things at any one time and I’m about maxed out without thinking about when to workout and what to do once I have the time to do it (do I do abs or legs? push-ups or burpees? full body or target one area?) Decision fatigue is a real thing and exercise started to feel like one more set of decisions that I just didn’t have the energy for. That being said, exercise is still really important to me. I know there are so many health benefits to exercise, both short-term and long-term, plus I also feel more energized and happy when I’m exercising somewhat regularly. I want to make taking care of myself a priority, not just for my own happiness but because I’ve got a little person watching at home and I want him to see that women can be strong. I want him to see that women can be great mamas, loving wives, caring friends, and still take time for themselves. I’ve just had to adjust my expectations with my lifestyle. I no longer have 90 minutes to go to the gym every day, but I can still do something! Today I thought I’d share a little about how I’ve changed things up to fit my lifestyle now and what I do to still get exercise while eliminating most of the decisions around it. This is what works for me as a stay-at-home-mom (SAHM) and might not work for everyone, but I share in hopes that it might be helpful for someone else to get ideas for how to squeeze in exercise in their own life. Gone are the days where I want to put any mental energy in to a workout regimen. I don’t have the capacity or desire to think about if I want to do biceps or triceps, elliptical or treadmill, cardio or weights. I literally just want to go to the gym and get a workout in without putting any thought into it. Because of this, I have fallen in love with group fitness classes at my local gym. I just show up, put my brain in low power mode while I just follow the instructor, and get a great workout in. I always leave feeling so energized and refreshed! Two mornings a week, I go to a bootcamp class. It’s a mix of cardio and strength training; sometimes we do our own little station, sometimes we complete an obstacle course. It changes frequently so it never gets boring! One afternoon a week, I take a cycling class. This is by far my favorite class and if I do nothing else all week, this is the class I do everything in my power not to miss. It is 45 minutes of a solid cardio workout and I can just zone out and work my booty off. I love it! My local YMCA offers childcare as part of our family membership and that is honestly the only reason I am ever even able to make it to the gym. I’m so thankful for this option! If your gym doesn’t have childcare available, another option would be to try to find a friend to do a childcare swap with (you watch her kids for an hour so she can workout and she watches yours for an hour, etc). As much as I would love to make it to all three of these classes each week, it’s just not always feasible. The bootcamp class happens in the late morning and sometimes LJ’s nap interferes. Other times, if he has a little cold or anything, I don’t take him because I don’t want him to spread anything around in the childcare. Or now that we’re in winter, the weather doesn’t always cooperate and I’m not going to drive out in snow and ice. Because of this, I’ve had to start relying more on in-home workouts. I’ve tried apps to workout at home in the past, but honestly, decision fatigue gets me there too. I don’t want to decide on a body area or figure out what workout to do. I don’t want to have to decide between YouTube or NikeFit, cardio or yoga, etc, etc. So I decided to purchase an entire workout program that makes all the decisions for me. I found Expecting and Empowered through Instagram and I only wish I had found them sooner! 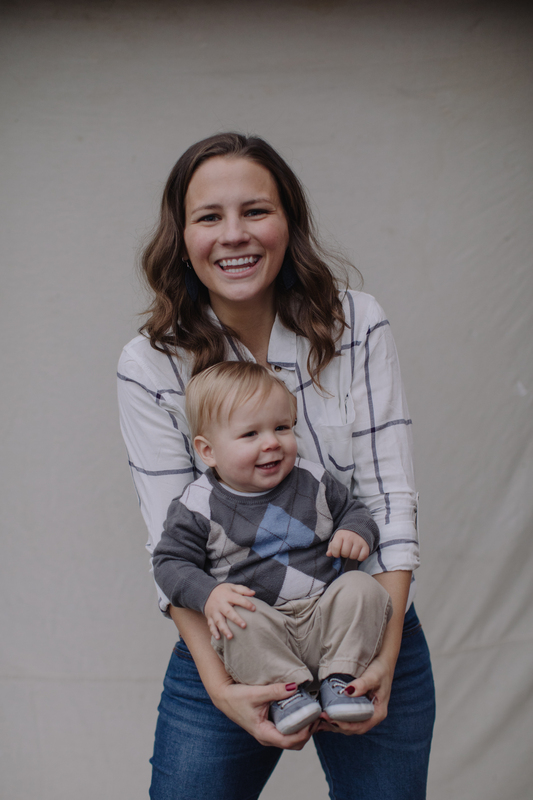 They have programs specifically tailored to mamas, both in pregnancy and postpartum (they even have one for mamas like me who are “further out” – meaning 10+ months postpartum). I haven’t had their program long, because I didn’t know about the pregnancy one until I was almost through my pregnancy with LJ and the postpartum ones only came out a few months ago but so far I am loving it! I love that their workouts are designed for busy mamas, with minimal equipment (just a resistance band and/or hand weights) and give a great workout while targeting areas of a woman’s body that are affected by pregnancy and need strength and healing. The program eliminates decision fatigue because I just follow along with whatever day I’m on. I can sometimes get the workout in during LJ’s naptime, but if that doesn’t happen, I’ve figured out a little set-up. It’s moments like these where I am reminded of Amy (co-creator of E&E’s) little mantra: “it doesn’t have to be perfect, it just has to be done.” And that’s so true with my at-home workouts. They look far from perfect. If LJ is awake, I set up in the hallway entrance of my house next to our playroom and set him up with toys and snacks. I imagine him cheering “go mama, go!” and just do what I can. Truthfully, that is my workout strategy for this busy time in my life. Do what I can. I make exercise a priority but understand that sometimes life happens differently than I plan for. Some weeks, I can get 5 workouts in. Some, I don’t get any. Most weeks, I am somewhere in the middle. And I’m learning to give myself grace to be okay with that. I do think it’s super important to know yourself and understand what is going to work for you. If decision fatigue is weighing you down and making exercise difficult to do, try eliminating as many decisions as possible. I wake up on Mondays and Fridays knowing I’ll be at bootcamp. If LJ is napping or sick or it snows, then I know I won’t go. But if none of those things happen, then I’m going. It’s not a decision to really make because I’ve already made it, and once I get there, the biggest decision I have to make is whether to use 8, 10, or 12 pound weights. I can handle that one decision! I encourage you to try to find ways to eliminate as many decisions regarding exercise as possible – it’s amazing how much more manageable it seems when you don’t have to use a ton of mental energy on it.